Emerald Sparkle, oh Emerald Sparkle, you’re finally here with me! I’ll write the whole story on how long I’ve been waiting for it and how it finally found me, in another post. Today, I just wanted to show you some similarities and differences between China Glaze – Emerald Sparkle and NYX – Las Vegas (the green version). After one coat, the polishes couldn’t be more different. Emerald Sparkle looks similar to bottle color, but Las Vegas is a yellowish-watery version of green with hints of shimmer. Not a very pretty picture to look at. Emerald Sparkle has a rough finish and Las Vegas has a smooth finish. 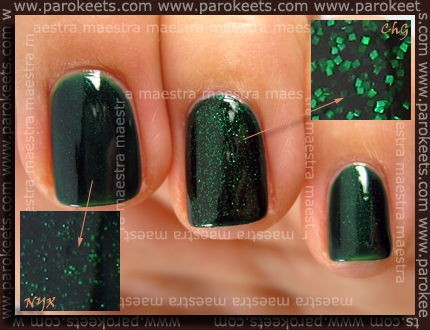 Emerald Sparkle needed 2 coats to be totally opaque, while Las Vegas needed three coats. At the end the polishes do look similar. At least the base color seems to be similar on both, but the main difference is the glitter/shimmer. Emerald Sparkle has square shaped glitter in it and there is a lot of glitter there, while Las Vegas has smaller shimmer. Both shades are beautiful. I mean, I can’t decide which one I prefer. Yes, Emerald Sparkle has a special place in my heart and it’s become one of my “Precious” polishes. But Las Vegas is also a real beauty and it’s easier to remove. :stars: I had no idea there was a dupe for Emerald Sparkle. Unless your a nail fanatic (uh, not me!) you could just buy one. Of course I have both. It’s a gorgeous polish. Tale China Galze Emerald Sparkle je res pravi lepotec.